Rob Cesternino and Akiva Wienerkur never shy away from their public displays of affection for Seinfeld, as they continue to bring you episode recaps week after week. This time, they break down an iconic one in “The Soup Nazi”, which first aired November 2, 1995 as part of season seven. The episode was written by Spike Feresten. News – There was a bit of Seinfeld news this week. The guys briefly discussed if this episode is the most memorable. Akiva had a different spin on Melania Trump’s speech from the convention. He feels strongly that she plagiarized Jerry by wearing a puffy shirt. Rob brought up how the show Mr. Robot‘s new season is littered with references to Seinfeld. Lastly, Keev mentioned how Long Island City is holding a screening of “The Summer of George”, plus a couple other episodes. Jerry’s Story – Jerry is dating a new woman named Sheila, who he shares a very public and cutesy affection for, calling each other by the nickname “Schmoopie”. While smitten with her, he’s even more smitten by the new soup restaurant where the owner is very strict about the ordering process. He also has to deal with George’s anger over Jerry’s newfound public displays of affection, to which he torments him over it by rubbing it in George’s face. 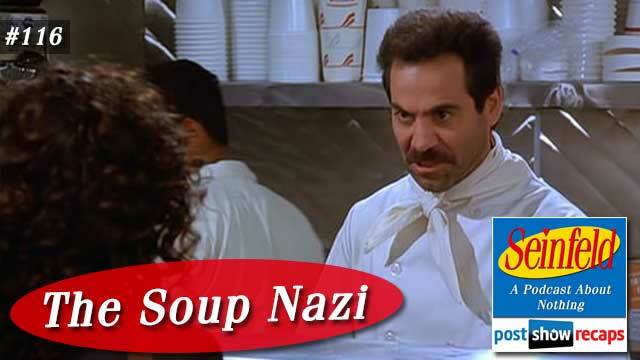 While at the soup restaurant with Sheila, the owner, known as The Soup Nazi, catches them kissing and wants to ban them, but Jerry doesn’t defend Sheila, essentially picking the soup over her. Elaine’s Story – When Elaine wants to get some food, Jerry suggests they go to the new soup place with the eccentric owner. On the way there, Elaine notices an armoire for sale on the street, so she stops to buy it. Her building super won’t allow her to move it in on a Sunday, so she elicits Kramer to stay outside and guard the armoire overnight. When Kramer asks her to get him some soup in return for watching it, she is too indecisive in line, causing The Soup Nazi to ban her for one year. Meanwhile, she commiserates with George about how nauseating Jerry and Sheila are with their baby talk, but bails on George when he confronts Jerry. When Kramer tells her The Soup Nazi is going to give her his armoire for free, she goes down there to express her thanks, but The Soup Nazi tells her if he knew it was for her, he’d have smashed the armoire to pieces. She discovers all the famous recipes in the armoire and decides to ruin The Soup Nazi by making them public. George’s Story – George starts off the episode on a bad note when he The Soup Nazi kicks him out for asking for free bread, getting told the classic line “no soup for you!”. After studying up on the procedures, he is able to successfully get the soup on his next visit, but not before The Soup Nazi tells him “you’re pushing your luck little man” when George comments on getting the free bread this time. His focus for the second half of the episode is on how disgusted he and Elaine are on Jerry and Sheila’s public displays of affection, particularly calling each other Schmoopie. But when he calls Jerry out, Elaine bails, leaving him to disparage Jerry on his own. When he tries to show Jerry how ridiculous it is by acting the same way with Susan, Jerry remains unflappable, but Susan really enjoys it, causing more problems for George in the long run. Kramer’s Story – Kramer’s main objective in the beginning of the episode is to watch Elaine’s armoire outside her building overnight until she can move it into her apartment the next day. While watching it, two “street toughs” notice it and steal it from him. While carrying on a conversation about the theft with The Soup Nazi, who he is inexplicably friends with, The Soup Nazi offers him his own armoire to give to his friend. 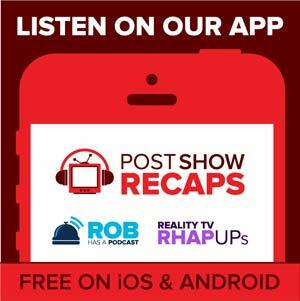 Rob and Akiva’s Tangents – There were many tangents in this two plus hour episode, but the guys started with discussing Rob’s process of getting verified on Twitter. Rob pointed out how it was quite out of character for Jerry to be on board with the “Schmoopie” and PDA. Akiva noted how former Sportscenter anchor Craig Kilborn was recently on the Bill Simmons podcast, and has lost his mind. Akiva shared how he and his wife used to intentionally harass his former college roommate with PDA. Akiva noted that they had a guest planned, but they had to cancel. Akiva thought that if he were to stop going kosher, he’d immediately fly to In-N-Out Burger. Grades and Rankings – Jerry got a B from Akiva and Rob, Elaine was deserving of an A, Kramer got a B+ and George got a B. Akiva decidedly said while it’s not the number one episode, The Soup Nazi is definitely in the top nine. Emails – Johnny De Silveira wondered why Elaine mentioned Lima Bean soup when it wasn’t listed on the menu. He also wondered why Elaine could be so brutal to The Soup Nazi, when she couldn’t bring up to Jerry how she doesn’t like the “Schmoopie” talk. Jim the physics correspondent said that Kramer would have woken up long before his core body temperature would have dropped so dramatically in “The Hot Tub”. Dan the benefactor wrote in upset that Vulture ranked this episode so low on their list. Akiva noted that Chester emails him once a week with how horrible their list is. Craig from Vancouver wondered if anyone milked more from a brief TV experience than Larry Thomas, who played The Soup Nazi. Liz asked if the guy who taunted Kramer is the same guy who got in his face for not wearing the AIDS ribbon, to which Rob confirmed it was. Max the millennial correspondent polled his friends wondering if they new about The Soup Nazi, and most did. Lindsay asked if either of them had a fast food restaurant they can’t live without. Akiva had a place in college that did it for him, but Rob didn’t have any that stand out as so important. She also wondered what Akiva thought about sitting on the same side of the booth. He’d take either, but would prefer sitting across. Rob would prefer to stay on the same side, if Nicole lets him. Jeff from Houston tried the real soup Nazi place and loved it, and he wondered if they ever have, but neither have been. Zack Brooks wondered how Jerry could choose soup over Sheila, and asked the guys what they would do. Both of them understood choosing the soup. Calib from Atlanta pointed out that the behavior of The Soup Nazi is illegal. Amir thought the depiction of the street toughs may not fly in 2016, but Rob didn’t think it would be offensive. He also noted that he couldn’t deal with an indecisive customer such as Elaine. Chester wondered why Jerry would go to a theatre further away from his apartment when he knows there to be one right around the corner. Akiva just made fun of him as opposed to answer. He also asked why there was a pay phone at The Soup Nazi’s, to which Akiva thought it was to keep customers from asking to use it. Tune in next week as the guys will recap “The Secret Code”. Send in your questions by emailing [email protected]. Don’t forget to subscribe to the podcast by going to postshowrecaps.com/seinfeldITunes where you can rate and review the podcast. You can get a discussion going about the podcast by leaving a comment on the show page, and as always, you can follow them on Twitter @robcesternino and @keev26.